The osteomas are benign rare neoplasms, generally asymptomatic which are characterized by the proliferation of a compact or spongy bone. When they are situated in the maxillofacial area, they affect mainly the mandible, the frontal bone and the paranasal sinus. We have described the case of a female caucasian patient who presented an increased volume in the posterior region of the oral vestibule on the left side. During the clinical examination an oral lesion was observed in the region of the left ramus of mandible. This lesion was motionless, consistent, and painless when palpated. In the image obtained from the computed tomography cone–beam (CBCT), we could observe an hyperdense, cylindrical region, with well defined borders, located in the medial surface of the left ramus of mandible, right below the mandibular notch. 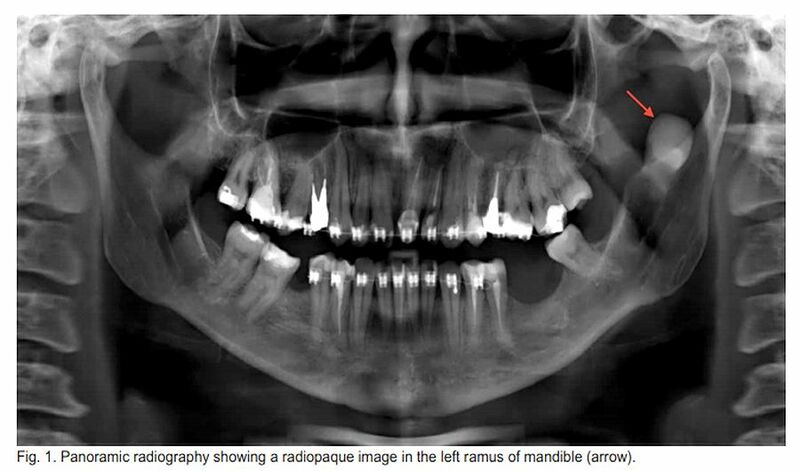 Based on clinical data and in the obtained images, we could confirm the presence of the peripheral osteoma in the left side of the ramus of mandible region.